Published in a hardback edition of 1,000 to coincide with the annual August exhibition at The Curfew Tower. 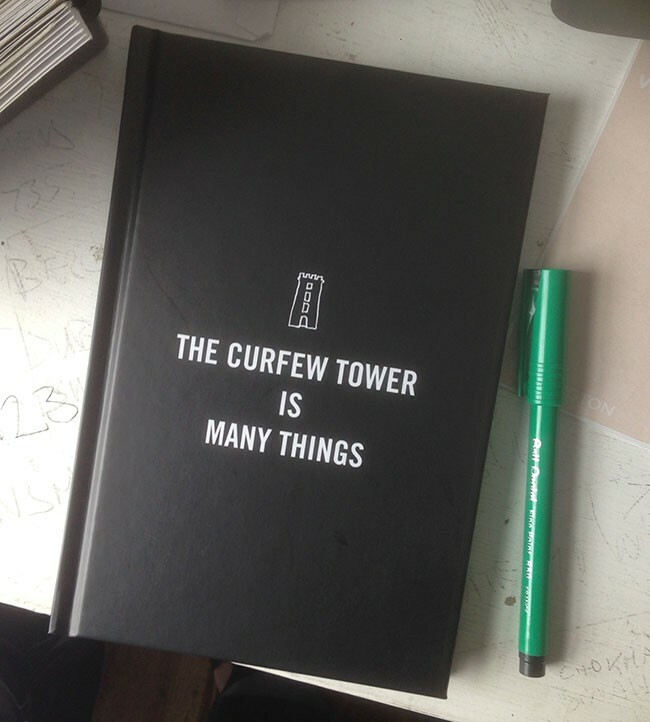 The book contains poetry and prose written by those doing residencies in The Curfew Tower throughout 2014 as well as an introduction by Bill Drummond. 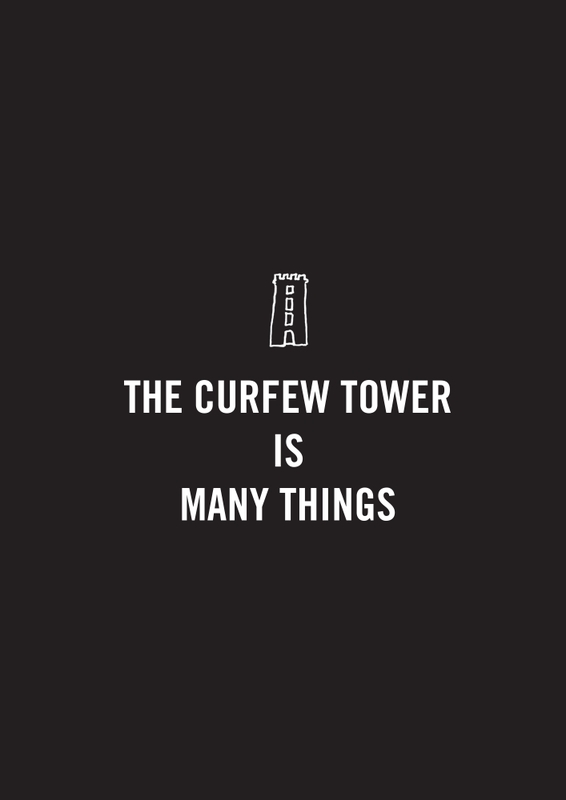 The Curfew Tower Is Many Things is a book containing many words. The words this book contains were written by the eleven people who did residencies in The Curfew Tower, Cushendall, Ireland during 2014. These words take the form of poems and prose. The people were selected by The Seamus Heaney Centre for Poetry in Belfast, from the best contemporary writers currently working in the north of Ireland. The book also contains an introduction by Bill Drummond and email dialogues between him and the eleven other people. The launching will be / was done in two parts. Between noon and 6pm you are / were invited to The Tower and in exchange for allowing yourself to be recorded while reading a section from the book you will be / were rewarded with a cup of tea (or soft drink) and a freshly baked scone with cream and jam. Between 8pm and midnight you are / were invited to the annual bonfire in the back garden of The Curfew Tower. There will be / were free bowls of Curfew Curry (both chicken and vegetarian) freshly made in The Tower’s kitchen that day. There will also be / were free glasses of wine while stocks last / ed. And they usually last until midnight. Around the bonfire will be / were a selection of the writers of the words in the book reading their poems and prose. Many things will be / were discussed around the bonfire, including the past, present and future of poetry and prose. And whether this years curry is / was better than last years curry. And whatever you want to talk about. This book was printed in an edition of 1,000 copies, there will be no second edition. Off these 1,000, 100 copies have been distributed across the small town of Cushendall, Ireland during their Heart of the Glens Festival in August 2015. 200 copies have been given to the Seamus Heaney Centre For Poetry in Belfast to be divvied up between the contributors to the book and who ever else they see fit. 250 copies are being sold to the public via Alimentation or direct from the kitchen at The Curfew Tower in Cushendall. 20 copies are being kept for Penkiln Burn Libraries. All the remaining copies of the book are being randomly left in bars and cafes across the island of Ireland by Bill Drummond over the coming weeks, months and years. In a very Drummond-esque manner, Irish artist Stephen Rennicks has started tracking down the whereabouts of the remaining copies on his blog. 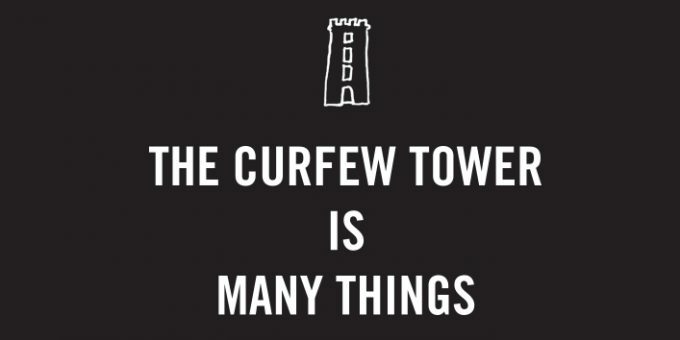 A new book, The Curfew Tower is Many Things, contains some of the work produced there during 2014, as well as Drummond’s moving tribute to Heaney, with whom he collaborated on a poetry workshop for schoolchildren from Bristol.